Then don't mess about, buy from the UK's No1 for Slatboard & Slatwall Fixtures & Fittings. We specialise in Slatwall, also called Slat Wall, Slatwall Boards, Slat Board Panels or Slatted Wall Panels. We offer excellent quality with next day delivery and hold one of the largest stocks of Slatwall and Slatwall Fixture & Fixings in the UK! Click here to view more or contact us for information. Slatwall is quite simply the most versatile wall covering material obtainable for both shops and offices. With a wide range of fixtures and fittings to slot straight in, Slatwall is the perfect solution every time. Our Slatwall comes in a huge number of styles, from melamine wood finishes such as Beech, Oak, Ash, Walnut and Maple to stunning colour finishes in black, pewter, blue, red, yellow, white and cream. If that was not enough choice, we can even supply raw MDF Slatwall, suitable for applying your own finish. Perfect for colour matching existing furniture or colour scheme within your premises. We've been working with Slatboard & Slatwall for a number of months now and have found them very responsive, highly competitive and very focused. This company is the cheapest I have found for Slatwall Panels. Great quality with a huge range of wood finishes and colours. A very professional service that I would recommend to anyone. I was able to completely re-arrange my shop within a few hours, Slatwall gives you endless possibilities and endless combinations to best utilise your retail space. Transform your business with not much more than a drill & screwdriver! Slatwall really is one of the simplest of interior shopfittings to install and whole rooms can be transformed in hours often with nothing more than a drill-driver! 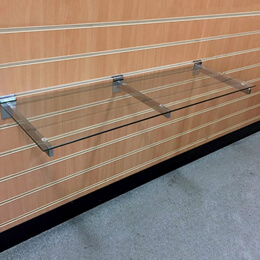 Want to optimise your display space? 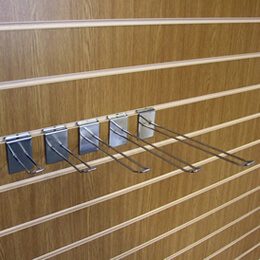 Have a look at our amazing display unit's to take the convenience of Slatwall on to the shop floor! You are being re-directed to our specialist shopfitting website.